Original hand illustrated artwork ... personalised occasion details ... bespoke frames and mounts ... Just three of many compelling reasons why your site needs to be listing these gorgeous wall mounted frames. 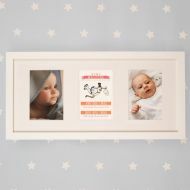 New Baby Illustrated Wall Frame: Stork Portrait. New Baby Illustra...: Stork Portrait.